You can void a perio exam that was performed more than 48 hours in the past to specify that it was not a valid exam for the corresponding patient. 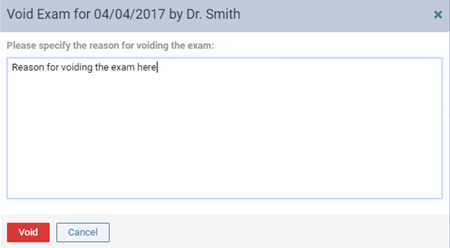 If the exam was done within the past 48 hours, you can delete it. However, you cannot delete or void a perio exam that is attached to a claim. On the Manage button menu, click (or tap) Void Exam. The Void Exam dialog box appears. Type the reason that you are voiding the exam, and then click (or tap) Void.